for what is looming large out there. club members, are at our cost or close to it. Best-Price Out There on Yoders Canned Bacon: Act fast! Yoders Canned Bacon is traditionally our most popular single listing. Today, we are discounting the Yoders bacon so that our club member pricing is killer! Can you live without bacon? All the feedback we get on this product is that folks are amazed at how tasty this Yoders bacon is ... and it stores in excess of 10 years! Eat it today or well down the road, and you'll be in hog heaven. 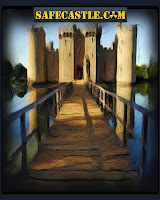 Now at Safecastle: AlpineAire and Gourmet Reserves ... Member Discounted! Safecastle is proud to now offer selected AlpineAire and Gourmet Reserves storage food packages, with special buyers club member discounts. AlpineAire and Gourmet Reserves foods have the proven top-quality track record that we look for in the foods we offer to our customers. Now under new management, they are even better than before, equipped to deliver orders in a timely fashion--an issue that in the past had plagued that supplier. Prepper Pete does,” said his frustrated wife. 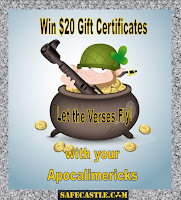 Win Gift Certificates with your Apocalimericks! Real preppers like a little rhyme (or is it reason?) in their chowder. 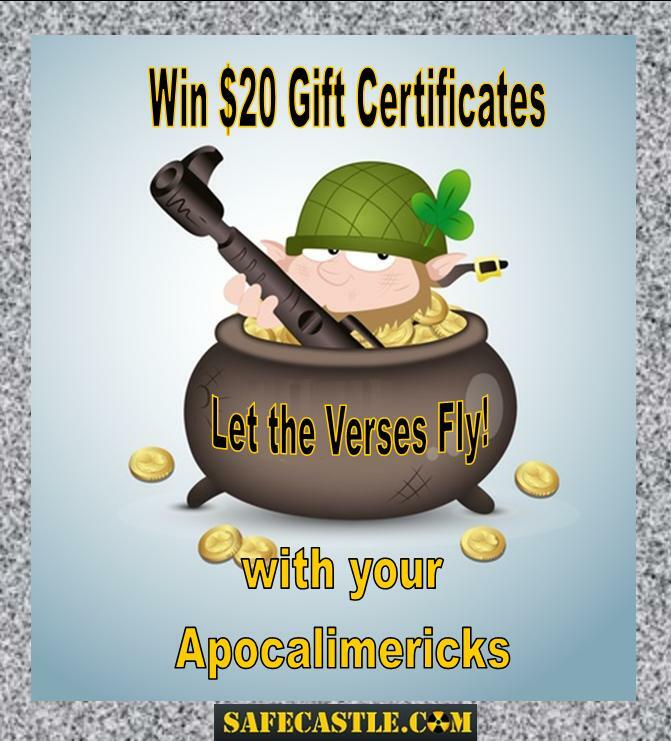 Score a Safecastle gift certificate with your submitted Apocalimerick if it is chosen as worthy. then stayed dry when the stuff started splattering. More Food Buckets! Check the Lindon Farms BIG DEAL! There's no question anymore ... preparedness is about survival, and this could very well be a near-term issue the way things are shaping up out there. We're doing all we can to crank-up the bargains and deals for you to make sure you're as best situated as possible. The deal we are posting today is a great example ... the Lindon Farms BIG DEAL. This offer includes a one-week variety meal bucket (20 year shelf life), your choice of a meat bucket (15 year shelf), AND a GoalZero SOLO LED flashlight ... at 19% off for the package. Reminder: Most of our Food Supply Depot and Food for Health International buckets (20-year shelf life) are 15% off ... and for members, 32% off! !There are 15 unique buckets to choose from. Shop our Bucket List Sale here today. Come April 1, producer prices on the Mountain House pouch buckets are going up. These MH buckets are filled with some of the best selling freeze-dried food varieties in pouches ... tested to last 25 years on the shelf! Two bucket varieties to choose from, or select both. Free shipping and member discounts DO apply. 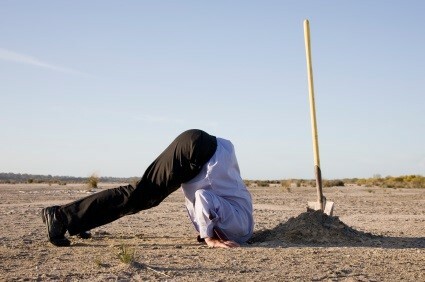 Breaking news: Observers are noting an alarming, sudden decline in the global population of "subterranean cranialists" ... status-quo, head-in-the-sand, bright-futurist viewpoints dissolving in the face of the brash moves by banking elites to confiscate depositors' funds in Cyprus, and reportedly in New Zealand too. Unfortunately, if you are one of the millions of folks now furiously rubbing your eyes trying to focus on the glaring reality of the situation, well, you are too late to get ahead of the curve. Nonetheless, you are still on pace to join the stampeding herds that are moving en masse to convert risky holdings into real assets that will hold or appreciate in value through a catastrophic global confidence crisis. 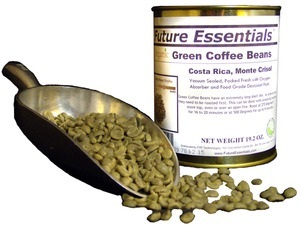 Think life-sustaining assets such as farmland, precious metals, firearms, ammunition, storage food, survival gear, and alternative energy sources. Anything that actually has a practical value and that you hold in your possession can qualify. The time is now to do what you must, or potentially suffer the consequences if you choose to further deny or delay. 50 Free Crisis Preparedness Buyers Club Memberships: Act Fast! As you know, a membership in our buyers club is the absolute smartest way to get serious about your crisis preparedness. In a nutshell, the benefits are summarized here. 2. SHARE the "50 Free Lifetime Safecastle Buyers Club Memberships" Facebook POST at the top of our Facebook page (linked in #1 above). Then, we will email you your coupon code you can use to make the free membership "purchase" in our store. 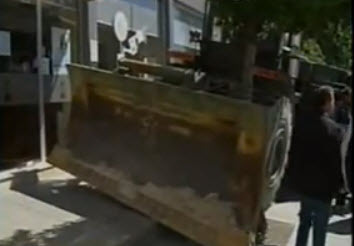 Cyprus Citizens are Well-Armed; Is the EU's Bank Account Tax-Confiscation There a Dry Run for Bigger Subsequent Actions? As most know by now, the EU has aggressively moved this weekend, if the nation's Parliament approves it, to impose a sudden and significant confiscatory tax on all bank deposits in Cyprus. A bank holiday has been declared for Monday and Tuesday at this point in order to prevent capital from fleeing the country. Bank runs in Cyprus are guaranteed whenever the banks do reopen. Given the fact that this unprecedented move implies that no one's bank deposits anywhere are truly safe, panic among account holders throughout Europe is possible. Not sure how that will play out and whether the fiends behind this move have carefully thought this all through. But what if they have put a lot of thought into this? Surely they are aware that Cyprus citizens are among the best armed people in the world (ranking number 6 in the rate of private gun ownership per 100 population). This could perhaps be a relatively small-scale test of how passive and pliable citizens are today, even when well armed. 1. a. 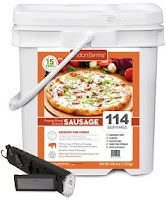 FOUR 15-year Lindon Farms freeze-dried MEAT buckets AND the Lindon Farms Storage Seeds bucket are all 10% off. Even better-- each of the meat buckets comes with a FREE GoalZero Crank Flashlight! b. All the Food for Health International buckets are 15% off ... for members,32% off!! There are 15 unique 20-year buckets to choose from. 2. Come April 1, producer prices on the Mountain House pouch buckets are going up. These MH buckets are filled with some of the best selling freeze-dried food varieties in pouches ... tested to last 25 years on the shelf! Two bucket varieties to choose from, or select both. Free shipping and member discounts DO apply. 3. We now have WaterBricks--robust, portable, stackable ... at great member prices! 4. LifeStraws are back in stock and ready to ship! 5. 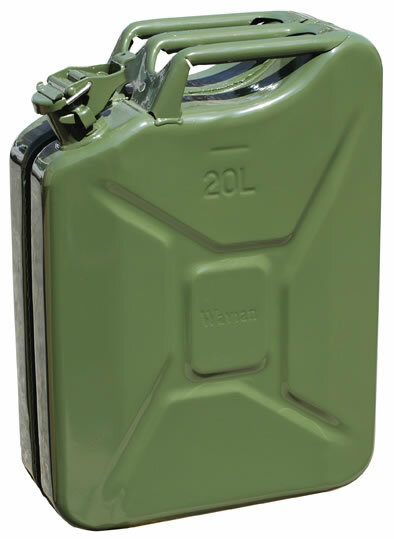 And Jerry Cans are shipping too! 1. FOUR 15-year Lindon Farms freeze-dried MEAT buckets AND the Lindon FarmsStorage Seeds bucket are all 10% off. 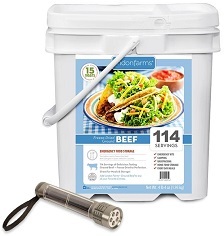 Even better-- each of the meat buckets comes with a FREE GoalZero Crank Flashlight! 2. All the Food for Health International buckets are 15% off ... for members, 32% off!! There are 15 unique 20-year buckets to choose from.